We've created Getting Started guides, examples and templates to introduce you to workflows. Click the + button at the bottom of the Workflows list; There are over 60 built-in workflows for you to choose from, and the Getting Started ones are the best ones to help you discover how to use workflows. 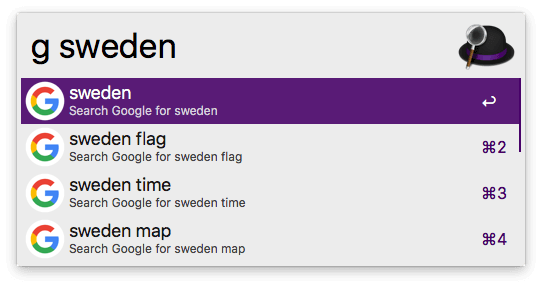 Take a look at the keywords set for the workflow; This is the keyword you need to type into Alfred to start using the workflow. 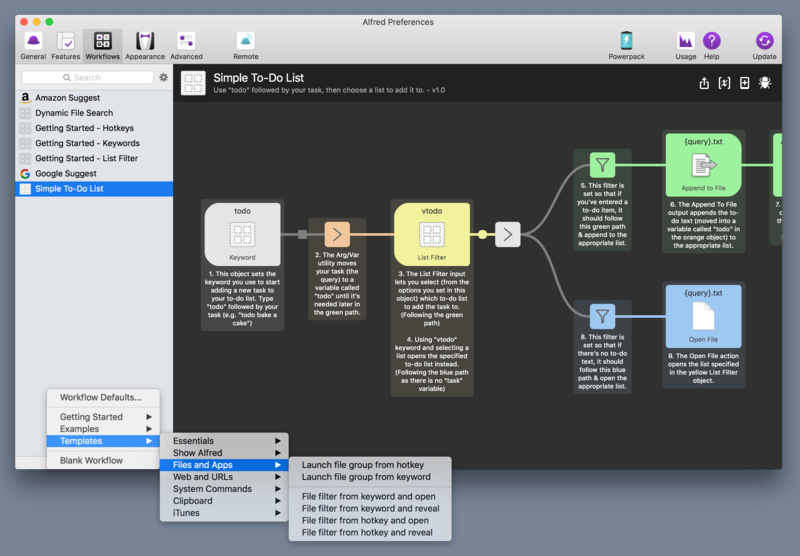 Each built-in workflow is annotated to explain what each object does. Clicking the [x] in the top right will also show you the "About This Workflow" information. Two of the built-in workflows provide you with in-line results for Google and Amazon. You'll find these by clicking the [+] button at the bottom of the Workflows sidebar, under Examples. Use the keywords "g" and "amazon" respectively, followed by your search term, to launch the workflow. Once you've picked a workflow template, double-clicking on each object will allow you to set it up as you want. For example, you'll be able to set your hotkey or keyword, choose what type of files are opened, and more. You can also add more objects to an existing workflow by clicking the + button in the top right and choosing the object types you want. Connect the objects together to make your actions happen! Find out more about adding your first workflow and creating your own workflows.